Whether it’s complete window and door installations on new commercial construction projects or a single door and window replacement for a home remodeling project, 5 Points Sash & Door are your door and window specialists. 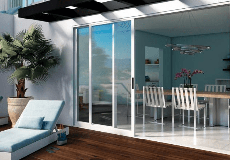 They offer the largest selection of high quality doors and windows on the market, along with expert installation (new construction or replacement) by master craftsman. Bring added beauty and energy efficiency to your home plus increase your property value with custom installed windows and doors. The friendly, courteous and professional staff ensures that all jobs are completed with no mess, no stucco repair needed, and no drywall damage left behind. Proudly serving Torrance and the greater South Bay area. 5 POINTS SASH & DOOR is rated 5.0 out of 5 by 6. Rated 5 out of 5 by Rabbit from Superb installation 5 Points installed two entry doors, 12 windows and 3 sliding glass doors in early June 2014. Their workmanship was excellent. The crew was very friendly, courteous, and professional. These guys really, really know their trade. The crew chief even accommodated me repairing several window sills before installing the windows. This saved me a lot of time subsequent to the install in the re-painting process. The installation far exceeded my expectations!! Rated 5 out of 5 by travelbug from they did everything right the first time I made an appointment with "5 Points Sash & Doors" to replace my rotted out dining room french doors. Between long term water damage from sprinklers, termite rot, and the sun/salt air; my doors did not even open. They educated me as to the best type of wood that would be appropriate for my issues, and the style of door needed. In addition I was concerned for sun damage to rugs and furniture. They measured everything accurately so the doors could be hung correctly. They were prompt, reliable and cleaned up meticulously. I did not even have to vacuum or dust after the crew left. I am so happy with my Tuscany hinged french vinyl doors from "5 Points Sash & Doors". I will recommend them to everyone and would not hesitate to use their services again for any future needs. Rated 5 out of 5 by Mimi from 5 points sash & doors is an honest company that is respnsive, knowledgable and customer oriented About a year ago, we decided to replace the windows in our single family house. We called a few companies to come to our place to give us a bid. The owner of 5 points sash took time to listen to us. Based on what we needed, he recommended the right type of windows (nail on rather than retro fit) to be put in our house and the style of the finished windows. More importantly, he helped us to understand the strength of Milgard windows. We were impressed by the life-long warranty of the Milgard windows. The owner of 5 points sash was knowledge, informative and responsive. He made constructive suggestions to help us solve egress window issues. The whole installing process was done without a glitch. The workers were friendly, prompt and they finished the work in a timely manner. We could not be happier about the new windows and we have been showing them to our friends and relatives. I had good experience with 5 Points Sash & Doors and would recommend this company to anyone without reservation. Rated 5 out of 5 by Mimi from 5 points sash & doors is an honest company that is respnsive, knowledgable and customer oriented About a year ago, we decided to replace the windows in our single family house. We called a few companies to come to our place to give us a bid. However, it was Aaron Franco who took time to listen to us. Based on what we needed, he recommended the type of windows to be put in our house and the style of the finished windows. More importantly, he also helped us to understand the strength of Milgard windows over windows made by other manufacture companies. It was his knowledge of Milgard windows, his informative explanations and his constructive suggestions to help us solve egress window issues that made us decide to use 5 points sash and to go with Milgard windows. We were glad that we made that decision. The whole installing process was done without a glitch. The workers were friendly, prompt and they finished the work in a timely manner. We could not be happier about the new windows and we have been showing them to our friends and relatives. 5 Points Sash & Doors has earned my respect and I would recommend this company to anyone without reservation. Rated 5 out of 5 by Mikx from This dealer has excellent customer service Owner Avi responds to emails and phone calls very quickly and always give clear answer. His personal attention, knowledge about our complex rules about windows/doors, detail technical specification of Milgard products and competitive price made the difference for our decision to choose them over others. Installer Felipe and his crew did an excellent job replacing 5 windows and 2 sliding doors within 1 and a half days, with great quality in fine details. They kept it very clean and with minimum noise. They were very polite and asked for permission for anything. It took only 2 to 3 weeks from the time of measurement to complete the whole project, just in time for the winter rainy and windy days before Christmas. We are very happy and would recommend this company to any one.